The Zener diode is similar to a general-purpose diode. When a reverse voltage exceeds the diode breakdown voltage, current starts to flow through the diode. For a Zener diode, the current increases dramatically to the maximum circuit value (which is usually limited by a series resistor). The reverse saturation current remains fairly constant over a wide range of applied voltages. The "Zener voltage" is when the voltage across the Zener diode becomes stable. 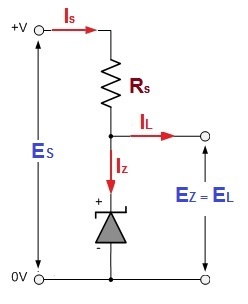 Because of this charecteristic, the Zener diode is often used as a voltage regulator in low power circuits. The minimum unregulated voltage supplied to the circuit. The maximum unregulated voltage supplied to the circuit. The rated voltage of the Zener Diode. The maximum current drawn by the load. The minimum current drawn by the load (should normally be 0 VDC). ES varies between 11 VDC and 13 VDC. IL(min) is 4 mA, but assume it will be 0 mA.